Of the quick easy dessert recipes this creme anglaise recipe produces the delicious custard sauce that’s on many famous French desserts. The most important factor in preparation is that you get the timing right and don’t overcook. But even if you do (it will curdle like mine did the first time) you can pour through a sieve and still get a delicious dessert sauce (no one will know). That’s why it’s the quickest and easiest of French recipes desserts. 1. In saucepan, add milk and vanilla and bring to a simmer. 2. Meanwhile, in a bowl whisk the egg yolks and sugar to blend. 3. When milk starts to simmer, pour a little hot milk into the egg yolk mixture and mix well using a wooden spoon. 4. Stir the mixture into the saucepan of hot milk over low heat. Stir constantly making sure you scrape the sides and corners of pan. 5. When mixture starts to appear glossy and your spoon feels slippery across the bottom of the pot, remove from heat and stir approx 2 minutes more. 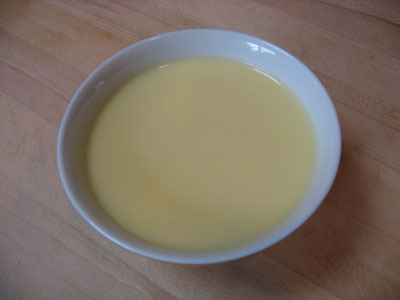 The custard is done when it coats the spoon and you leave a trail when you swipe your finger across. 4. Important! If you cook it too long it will curdle, so it's a fine line. If it curdles don't worry, just pour through a fine mesh sieve. 5. Cool before serving for mousse desserts or other cold desserts. Or, serve warm depending on your dessert by keeping it over warm (not hot) water. …For more fabulous French dessert recipes and easy French recipes. The French drink wine with their famous French food as a compliment to their desserts. Visit the French wine regions where you can taste and drive through beautiful countryside. Why not shop first to get an appetite... the best shopping in Parisguide for you.